“Conservatives for Britain has been formed among Tory parliamentarians to discuss the criteria by which to judge the Government’s EU renegotiation. We are willing to consider how to prepare for an ‘out’ campaign if, lamentably, the European Union establishment will not allow the UK a new relationship of trade and co-operation.” So writes the new group’s Chairman, Steve Baker, the decent, principled and honourable MP for Wycombe. And after a few plaudits hurled in the direction of the Prime Minister (for having “secured a cut in the European Union budget”, and having “kept us out of a centralising EU fiscal treaty”), Mr Baker gets to the nexus of the matter: Conservatives for Britain want to trade freely with the EU without the political commitment to ‘ever closer union’, enshrined in the founding Treaty of Rome. “We are an outward-looking, free trading nation which feels acutely the lack of democratic consent for European supranational government,” he says. The thing is, the European Union was never conceived as a democratic entity: indeed, it could only be constructed by anti-democratic, bureaucratic incrementalism. It was never designed to flexible or open, and less still responsive to the will of the people, as successive referenda in Denmark, France, the Netherlands and Ireland have shown. The trajectory toward political union is fixed: if the people vote to the contrary, they are sold a pup and asked again – and again, if necessary, until they give the pre-ordained answer. He has indicated about ten areas for reform. As a recent Business for Britain report set out, they are: an end to “ever closer union”, reduced regulation for small businesses and start-ups, domestic control over social and employment law, protection for the City, exemption from Eurozone intervention, fast-track trade deals, a reduced EU budget, greater transparency, migration controls for member states and the right for Britain to veto EU laws. And it is the self-appointed task of Conservatives for Britain to explore “the extent to which those goals have been met in the renegotiation package and whether they are sufficient to recommend EU membership to the British people”. Meaning, presumably, that Conservatives for Britain is a nascent ‘Out’ group which will campaign for a ‘No’ in the forthcoming referendum, not least because ‘ever closer union’ isn’t up for negotiation: it would require fundamental (truly fundamental) treaty change, and that would require an inter-governmental conference to draw up a new treaty, which would need to be unanimously agreed by all EU heads of state, which would need to be ratified by each state’s parliament, some of which would be constitutionally bound to put the matter to a referendum. The Lisbon Treaty changed this slightly with its ‘passerelle’ clause (48.6-7), which effectively created a self-amending treaty such that the European Council, deciding by simple majority, might convene a Convention to adopt amendments to the treaties. Although national parliaments may veto proposals, the use of the ‘passerelle’ does not require ratification by the member states. It is all very tediously nuanced, if not politically subversive, but it is not possible to see how David Cameron could secure a package of reforms which essentially gives the United Kingdom all the advantages of EU membership without any of the costs. The ‘fundamental change’ required must restore the sovereignty of the British people and the political primacy of the UK Parliament, and it isn’t clear at all that the Prime Minister has that as an objective. But David Cameron has already determined that it is in the national interest to remain in the EU, and we learn today that all members of the Government (that is, the entire payroll right down to the lowliest PPS) are to be bound by collective Cabinet responsibility: “If you want to be part of the government you have to take the view that we are engaged in an exercise of renegotiation to have a referendum and that will lead to a successful outcome,” he said, rather presciently, if not prophetically. So, there you have it: unlike Harold Wilson, who was rather more latitudinal with his 1975 EEC referendum by permitting his ministers to campaign for a ‘No’, David Cameron says it is not possible to be a part of this Conservative government and support secession from the EU; that it is not possible to uphold the sovereignty of the British people and the supremacy of Parliament and serve in a Cameron administration. The inference is that Brexit is incompatible with the fundamentally conservative principle that EU law should not override UK law; that advocating Brexit is irreconcilable with being a Conservative. This is an unacceptable deception, which one must hope Conservatives for Britain will refute directly as a matter of urgency. Apparently, the Prime Minister’s comments were “over-interpreted” (by seemingly every journalist present and every news outlet which reported them). 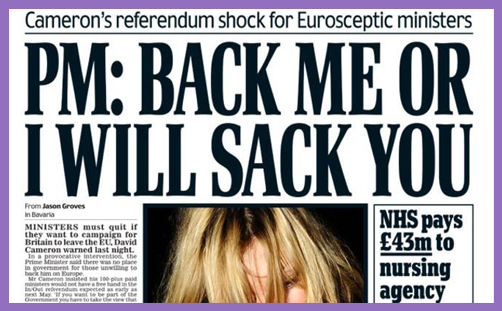 There is now no ultimatum for Government ministers to support the negotiated settlement or resign (or be sacked). Thus collective Cabinet responsibility seems not to be applicable in the EU referendum campaign. Cameron says on the one hand that the Government is “not neutral” on the matter of recommending continuing EU membership on his renegotiated terms, and yet, on the other hand, he intimates that members of the Government will be free to oppose. Take care, however, for this clarification may have been over-interpreted. The Prime Minister’s spokesperson’s “over-interpreted” has now been further clarified by the Prime Minister himself as “misinterpreted“. It is not known at this stage if this will be subject to further clarification, or whether our apprehension of ‘misinterpreted’ may be an over-interpretation.